Pluto, formerly considered the ninth planet in the Solar System, was discovered by astronomer Clyde W. Tombaugh in Arizona on February 18, 1930. Pluto is now considered a dwarf planet and a member of the Kuiper belt. Pluto is the smallest planet, smaller even than Earth's Moon. Most often, it is farthest away from the Sun, but sometimes Neptune is. Pluto is the smallest of all of the planets in the Solar System. It weighs 12,500,000,000,000,000,000,000 kilograms. While this may seem large, it's only about 1/500th of the Earth's mass. 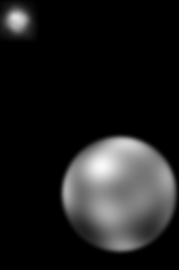 Pluto is between 2200 and 2400 kilometers across. Its surface area is about 17,950,000 square kilometers (or 1/30th of the Earth's). Its volume is 7,150,000,000 km2 (or 1/150th of the Earth's). We don't really know for sure. No spacecraft has ever been there, and even the best telescopes can't see any detail. It is certainly very cold, about -230 Â°C. The surface is covered with ice. Pluto also has a very thin atmosphere which freezes when Pluto moves further from the Sun. 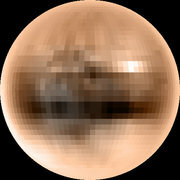 The image to the left shows Pluto's color. What is its moon like? Pluto has three moons. The largest is called Charon. Charon is about half as wide as Pluto. Its surface is covered in water ice. In Roman mythology, Charon took dead souls across the river Acheron to the land of the dead. The discovery of the other two moons were announced in October 2005 by scientists using the Hubble Space Telescope. These are very small moons that are almost 40 km across. Because they are so far away almost nothing is known about them. One day on Pluto is about 6.387 Earth days long. Like Uranus, Pluto also spins on its side. How long is a year on this planet? One year on Pluto would be about 90,613 days or 248 years on Earth! Scientists believe Pluto is made mostly of rock and ice, but they will not be sure until more research is done. The discovery of Charon helped scientists estimate the density of Pluto. The information collected told them what Pluto was and was not made out of. If Pluto were made out of heavy solids, it would have a very high density. If it were made of gases, it would have a low density. Pluto is somewhere in between, so it is probably made of rock and ice. How much would Pluto's gravity pull on me? If you were on Pluto, gravity would be only 0.06 times as strong as it is on Earth. This means you could do really high jumps like people on the Moon! Is Pluto really a planet? Some scientists say that Pluto isn't really a planet. They say it is too small, and point out that Charon is half its size. Also, Pluto, like Kuiper belt objects, is affected by the pull of Neptune. This is why they think Pluto is just a very large Kuiper belt object. Right now, there is no clear definition of a planet. One definition would make most objects in the Solar System planets. Under the other definition, most planets now would no longer be called planets! The organization that names Solar System objects is called the International Astronomical Union (IAU). Right now, they are debating the definition of a planet. This means that, for now, Pluto is still a planet. In the world of astronomy, there are many opinions on this subject. Is there a tenth planet beyond Pluto? In July 2005, astronomers announced the discovery of an object they are calling the tenth planet. This object is called 2003 UB313 for now. It will be given a permanent name by the IAU once they decide whether it as a planet or a Kuiper belt object. The discoverers are calling this object a planet since it is about 1 1/2 times the size of Pluto. They argue that if we call Pluto a planet, we must also call 2003 UB313 a planet. Astronomer Mike Brown suggested the name "Persephone" for the tenth planet. How long does it take Pluto to travel around the Sun? 2) How long is a day on the planet Pluto? 3) An object weights 100 pounds on earth. What would be its weight on Pluto? 1. Why do some scientists think that Pluto is not a planet? c) Pluto is just a very large Kuiper belt object. 2. Which statement is not true of about Pluto? d) Pluto has 3 moons. 4. What is the surface of Pluto like? 5. Who is Pluto named after?